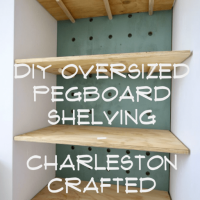 If you want to make pegboard shelves for your home, you will love this simple DIY tutorial! One of my biggest pet peeves that seems to be the normal for everyone else is metal, wire shelving. Why is this such a thing? Things don’t sit on it right and it’s so flimsy and cheap looking. We have added wood shelving to a lot of closets (our condo pantry, our condo laundry room, our current pantry, our current closet) and it just makes a world of a difference in feeling more luxurious and custom. 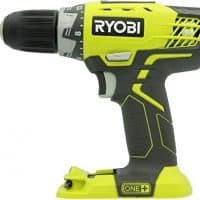 But it is an easy DIY! 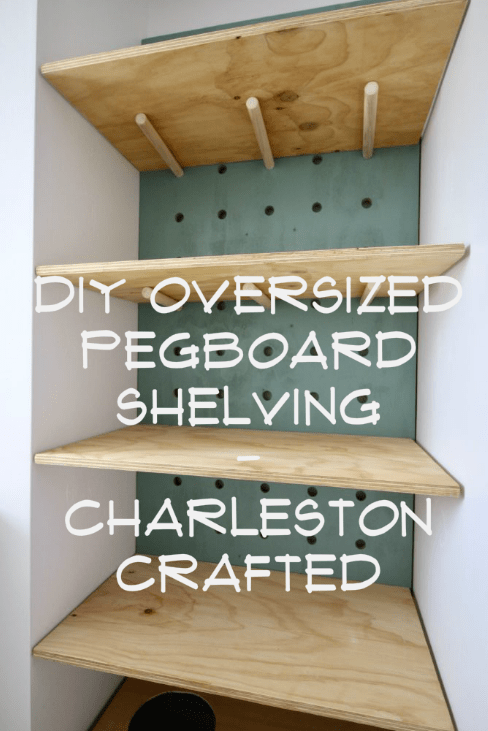 For this space I wanted to do something a little different and attempt some over-sized pegboard shelving. I love the concept of easily adjustable and really love how well this project turned out. 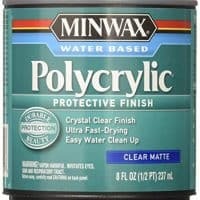 Love doable DIY? Sign up for our FREE weekly newsletter! The sizing of your space will be custom, so I won’t worry about measurements, just make sure you cut yours to fit what you’re looking at. The first thing we did was make all our cuts. First, cut the first sheet of plywood to the size of the back of our space. Then we cut four shelves out of the second sheet of plywood. Ours were 18×32. Last set of cuts was for the dowels, which is what the shelves will sit on. I cut each dowel into thirds. 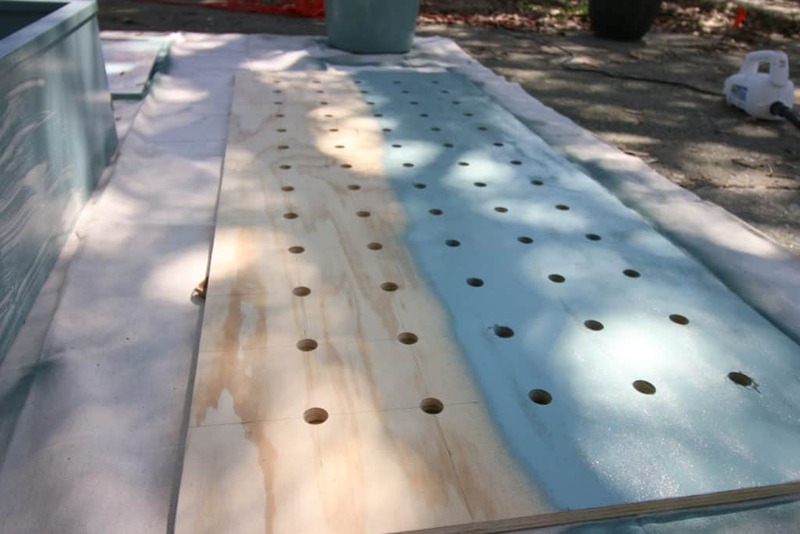 If you are wondering how to make a pegboard, pay attention to this next step! 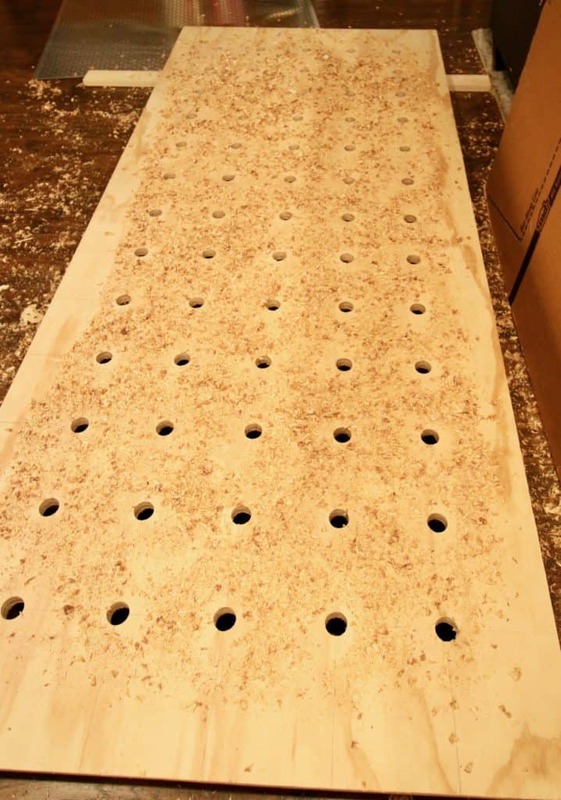 The next step was to drill the holes for the pegboard. We decided to do five holes per row, so what what we did was draw a line down the center of both the height and width, then drew lines ever five inches in each way to make a grid. 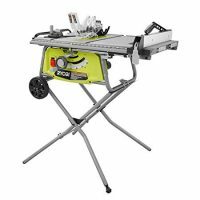 We used a 1 inch spade bit to then drill a perfect hole through the plywood at each of the cross hairs that we had drawn. After everything was dry, it was time for assembly. 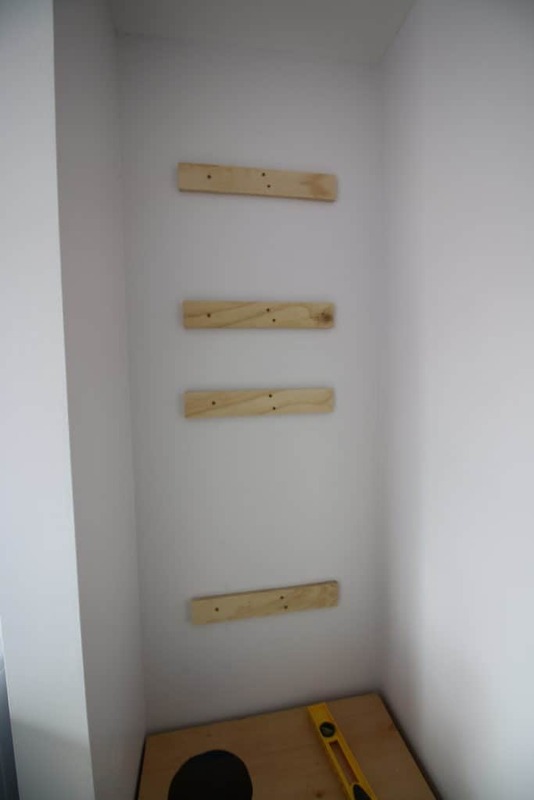 We drilled two pieces of scrap wood into the studs of the wall, making sure it was in spots that wouldn’t show through the peg holes. Then, we attached the pegboard to the wood on the wall. The rest was easy. We inserted the dowels three to a row at each height we wanted the shelves. Then we just set the shelves on top of the dowels. The shelves are now totally adjustable if we need to move them around depending on what we put on them. They look great and are extremely custom and unique. 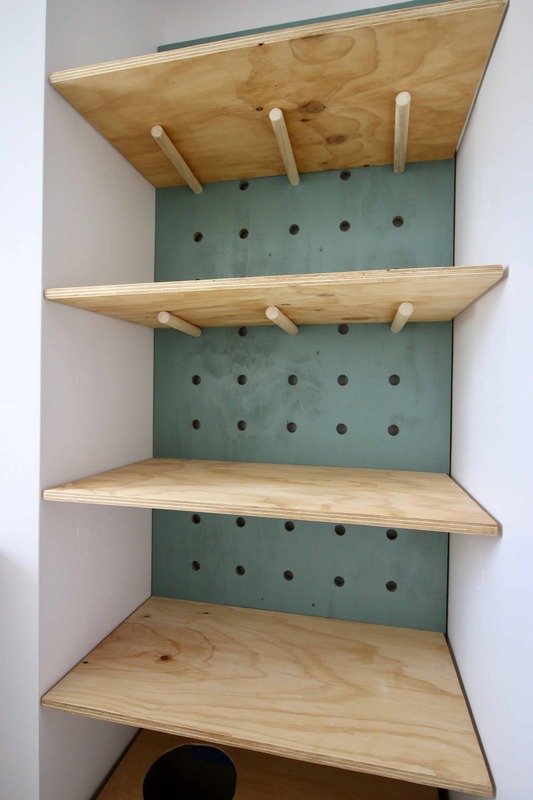 Wooden shelves add a lot of function to any space. 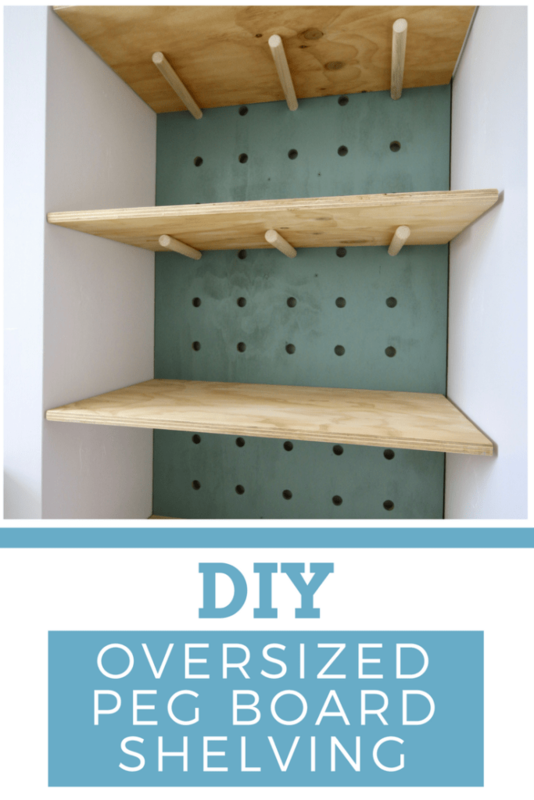 Make something a little different with these whimsical DIY oversized pegboard shelves! 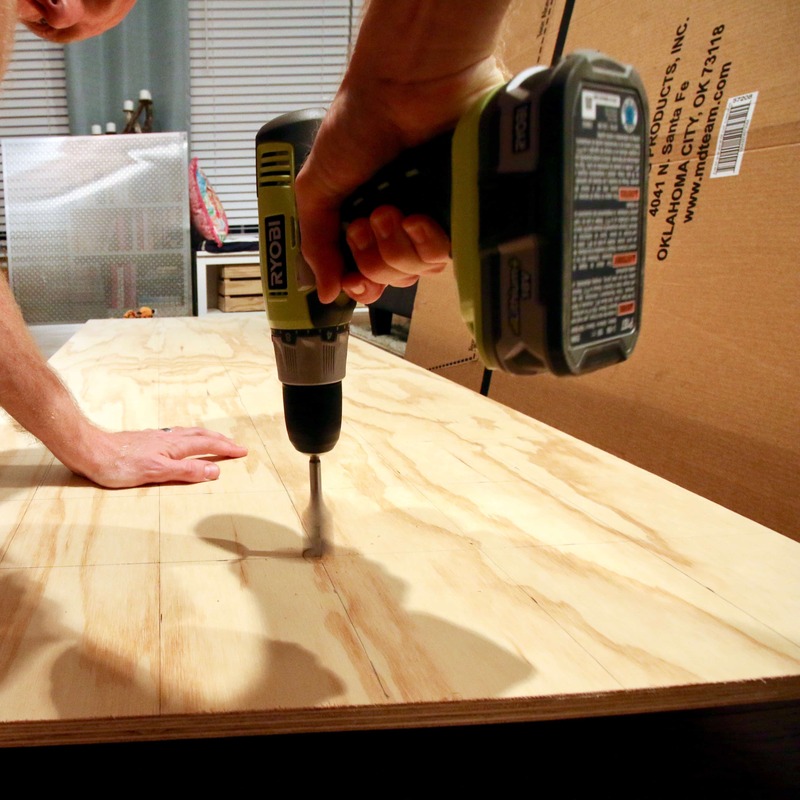 Cut the first sheet of plywood to the size of the back wall where your shelves will go. Cut four shelves out of the second sheet of plywood. 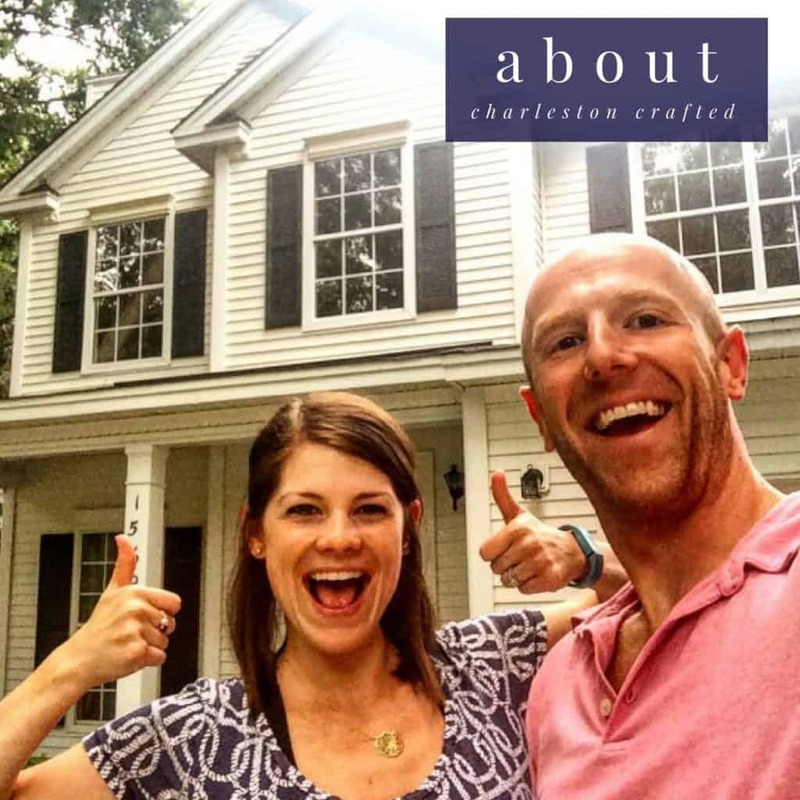 Ours were 18×32. Last set of cuts was for the dowels, which is what the shelves will sit on. 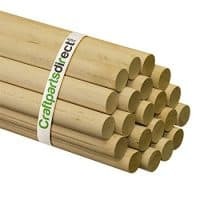 I cut each dowel into thirds. 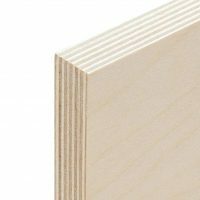 Draw a line down the center of both the height and width of the piece of plywood for the back wall, then drew lines ever five inches in each way to make a grid. Use a 1 inch spade bit to then drill a perfect hole through the plywood at each of the crosses that we had drawn. 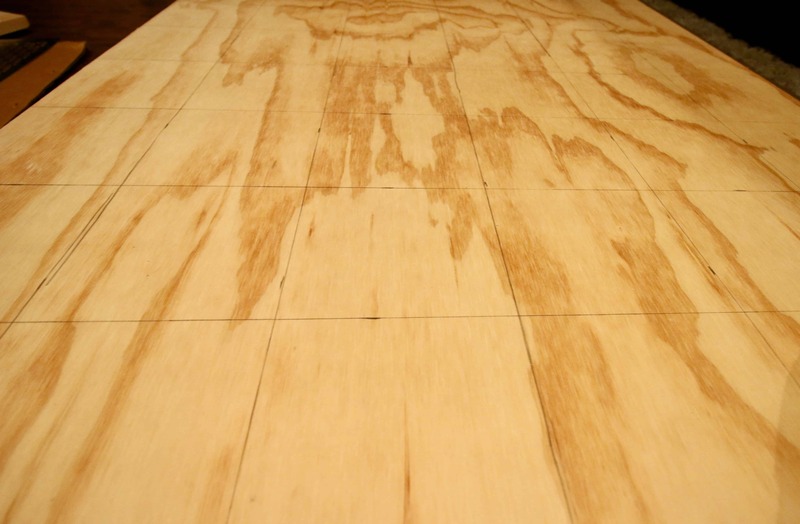 Paint, stain, or seal the plywood as desired. 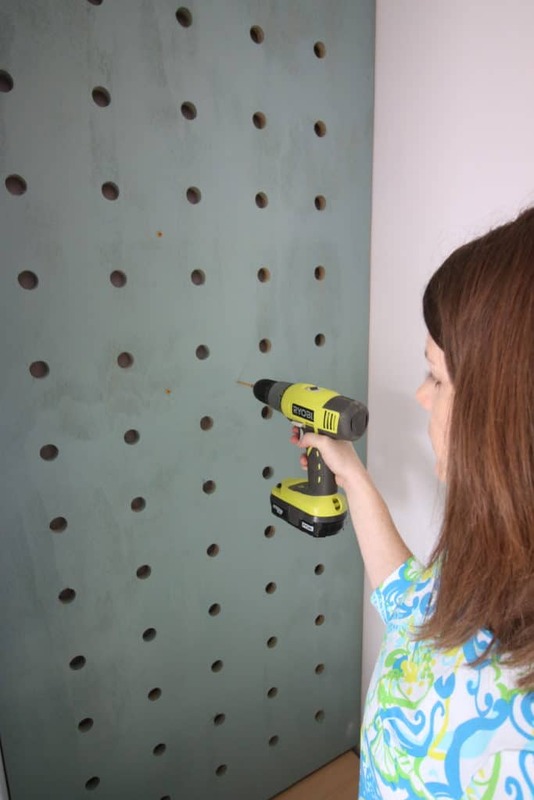 Attach the pegboard to the wall. Attach the pieces of scrap plywood to studs or anchors and then drill the pegboard into those pieces. Inserted the dowels three to a row at each height you want the shelves. Then just set the shelves on top of the dowels. Set your own measurements to fit your space. The shelves are adjustable by height. 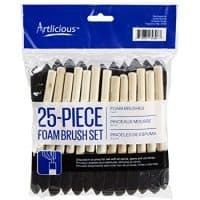 Be sure your dowels stick out enough so that the shelves are secure. They need to be at least 3/4 the length of the boards for stability. 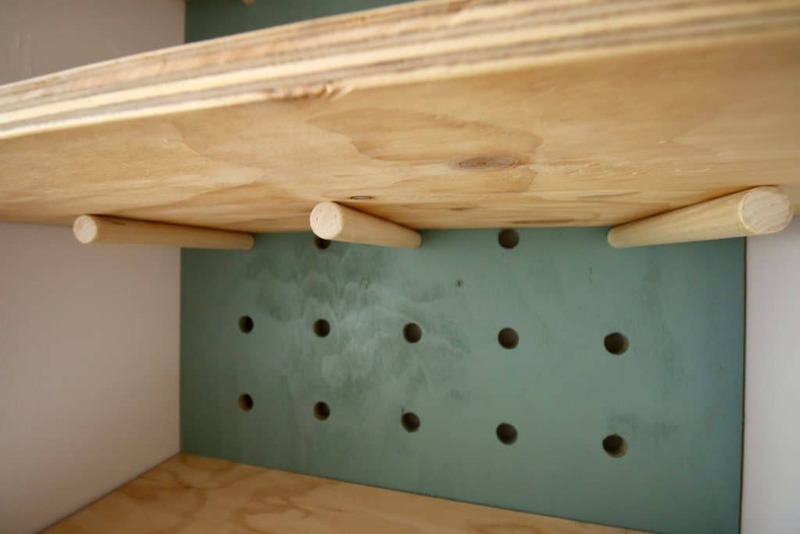 Wooden Dowel Rods - 1"
We hope you enjoyed learning how to make a pegboard shelf. Tag us if you decide to make your own version! Can’t wait to show you what we put ON the shelves and how we matched them somewhere else! Be sure to check out our final Laundry Room reveal here! 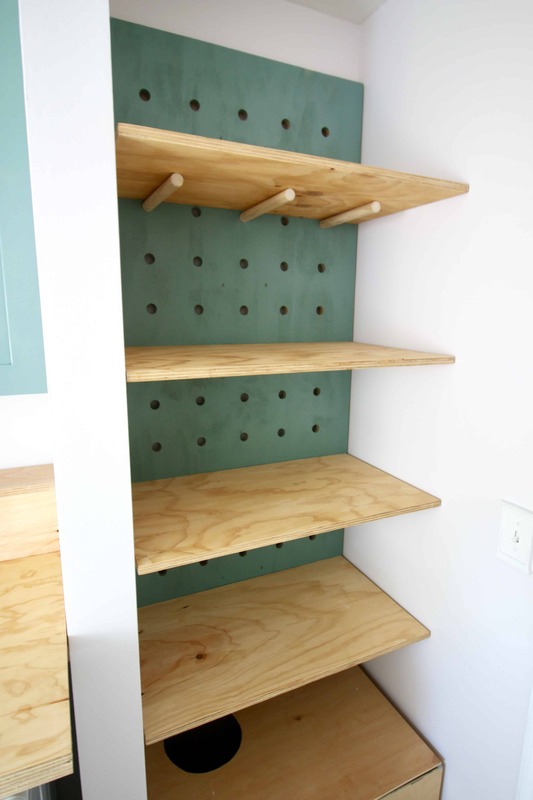 Hi there, How much weight would you say these peg board shelves can hold? I’m considering them for a retail space to hold large glass jars. Hey Marilla. 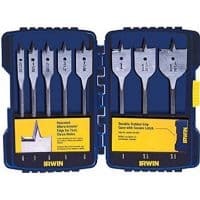 I think these would look awesome as a display shelf. They hold a pretty good amount of weight. I don’t have an exact measurement, but on the lowest shelf is a full bag of cat food, plus all our pet supplies. 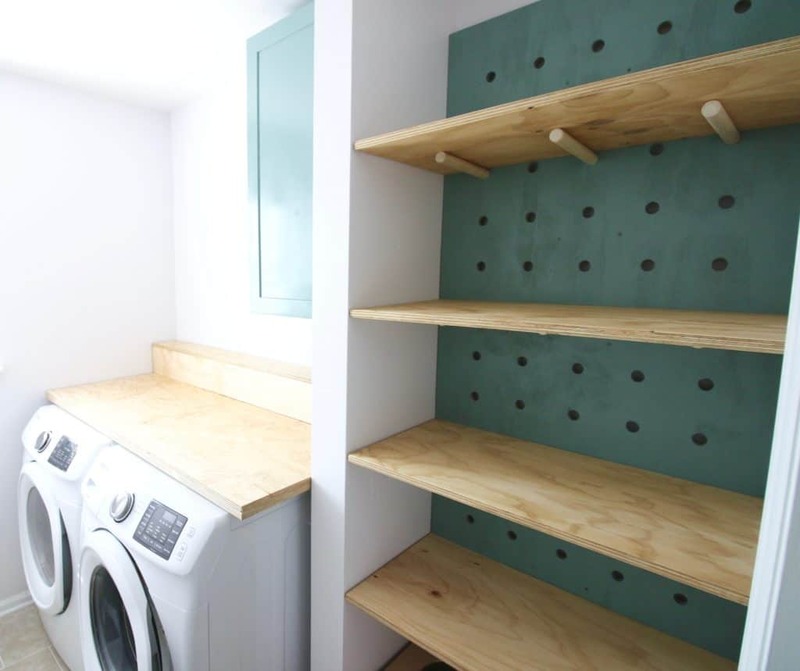 One shelf is all towels. One is several sheet sets. The top shelf has a steam cleaner plus a bin of beach towels. Overall, I think it would hold a lot. As long as the pegboard is secured to studs and the dowel rods are fully through the holes, they should hold a large amount of weight as they are very solid pieces of wood. If you have any other questions, please let me know, and if you do build this out PLEASE share it with us as we’d love to see how it turns out!